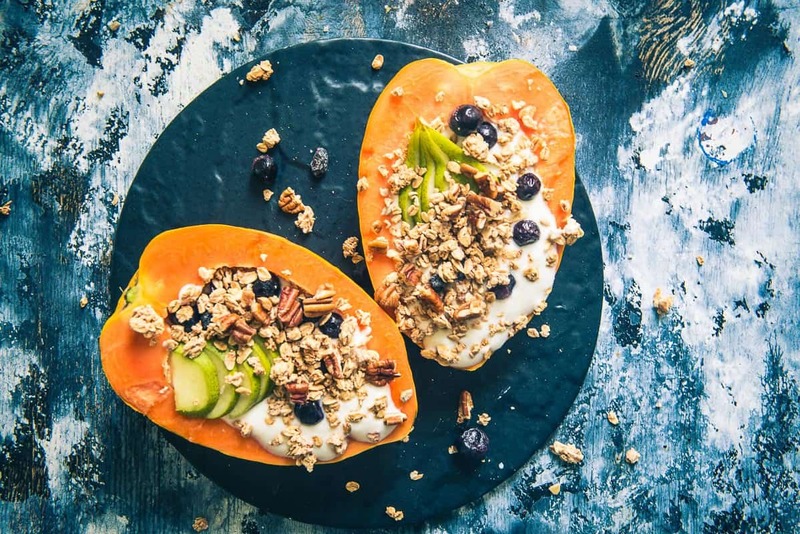 Papaya Boats is a healthy and delicious option for breakfast or snacks which looks irresistible as well. Eat the toppings and then scoop the papaya for a filling breakfast. Here is step by step recipe to make Papaya boats. I always believe that the key to eating healthy is to make everything you eat look absolutely irresistible. 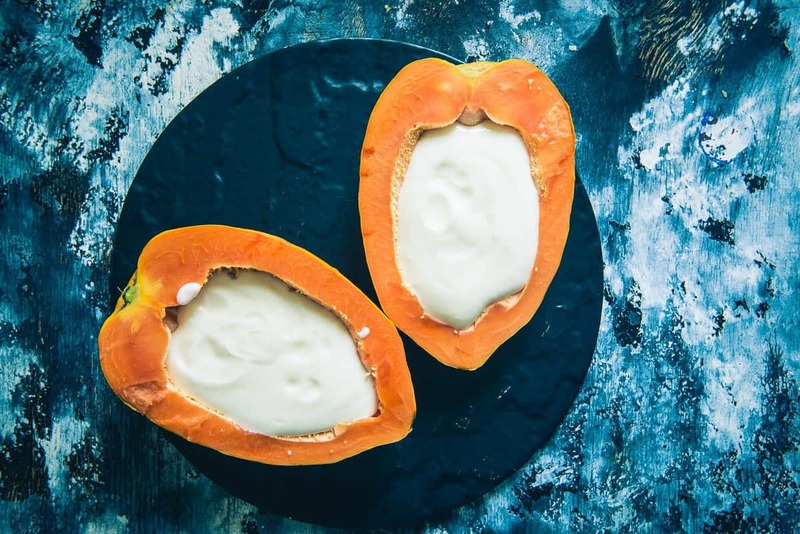 Today I’m making a super simple tropical treat called Papaya boats; it’s made using ripe papayas and some other fruits and yoghurt to make it look absolutely divine. It’s also one that tastes just as good as it looks. This summer, it’s time to throw away those bowls and to substitute them with these super good- looking fruit bowls. This papaya boat is made entirely from fruit and the only kitchen utensil you would require is a nice big spoon to devour it. 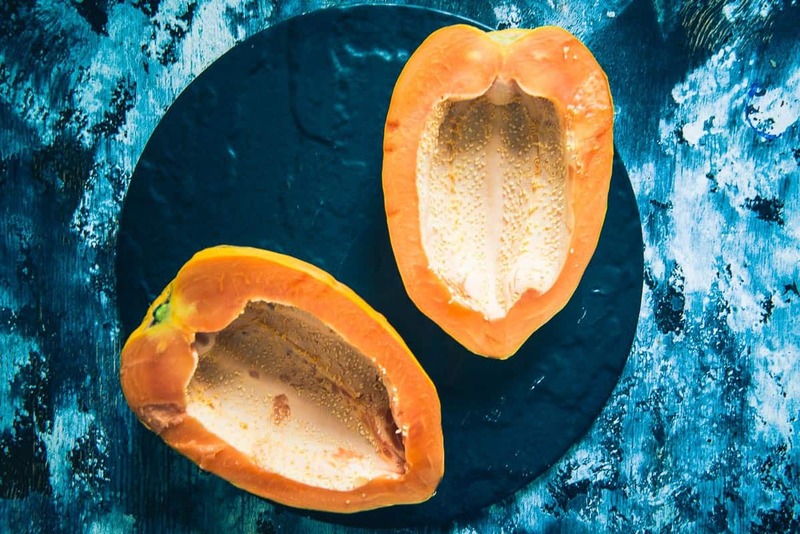 Papaya is a delicious, sweet fruit packed with the essential Vitamin C, A and folate. It’s also high in minerals like Potassium, Magnesium and Calcium. Added nutrients like dietary fibre and carbohydrates make it great to boost digestive health, help lose weight, improve skin health and also improve immunity. This recipe is really simple and instead of plain papaya cut into cubes, make this decadent dessert or snack the next time round. 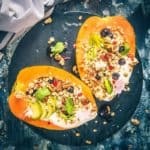 What’s great about this papaya boats recipe is that you can make it with your kiddos as this recipe doesn’t require any cooking on fire. This is one recipe you can play with and add fruits and toppings that are readily available in your kitchen apart from those mentioned in the recipe. 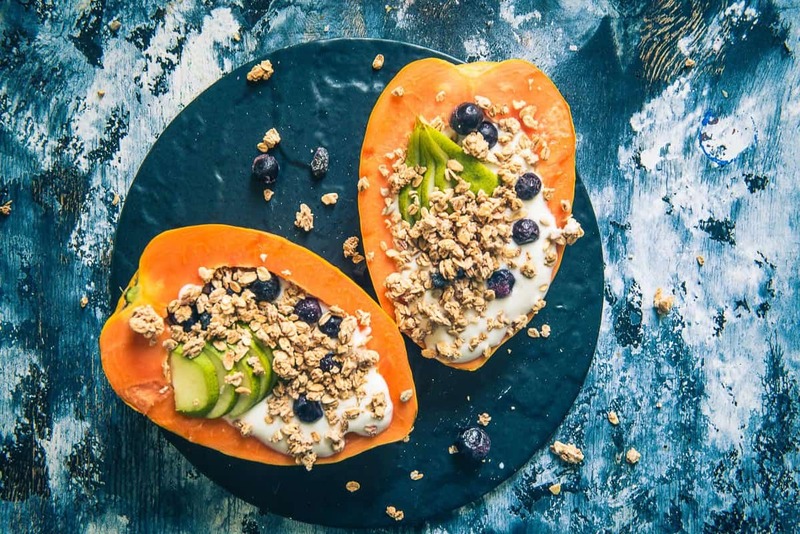 This papaya boat reminds me of a tropical holiday and given that papaya is readily available in India almost all year round, this is definitely one recipe you’ve got to try. 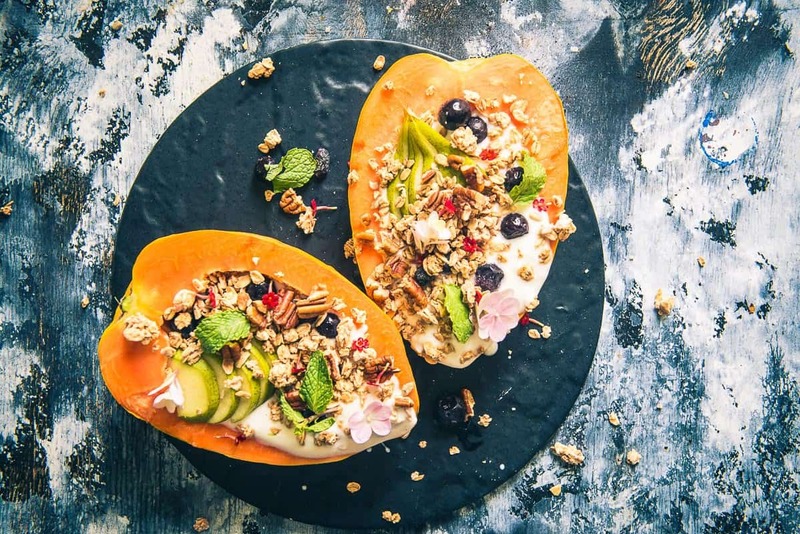 To make this delicious papaya boats recipe, first papaya is cut in half lengthwise and the seeds are removed. Now, into the hollowed out centre, whisked vanilla yoghurt is added and it’s topped with pears and blueberries. You can add the fruits of your choice and according to availability. Finally it’s sprinkled with granola and garnished with fresh mint and edible flowers. This dish is to be served immediately, based on availability, you could also add fresh or frozen raspberries and coconut shavings to your papaya boat. 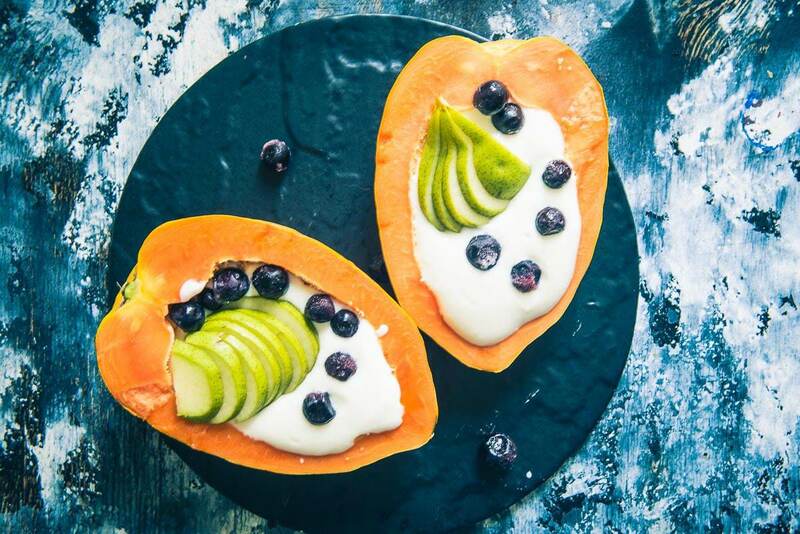 Overall, this papaya boats recipe is a great healthy summer treat to try; it’s a great way to celebrate the tropical climate of the land. You could make it for a cocktail party or just as a snack for the kiddos, with all the beautiful colours and the freshness of the fruit, they are sure to love it. Some of the other healthy recipes I’ve posted are: Starfruit Almond Salad, Summer Fruit Salad, Oats Coconut Caramel Fruits Parfait, Fruit Skewers with Honey Vanilla Yoghurt Dip and an Indian style Delhi Fruit Chaat. Cut the papaya into half lengthwise and remove any seeds. Keep the papaya halves on the serving plate. Pour whisked vanilla yogurt in the papaya cavity. Top with pear and blueberries. Garnish with fresh mint and edible flowers. Serve immediately. 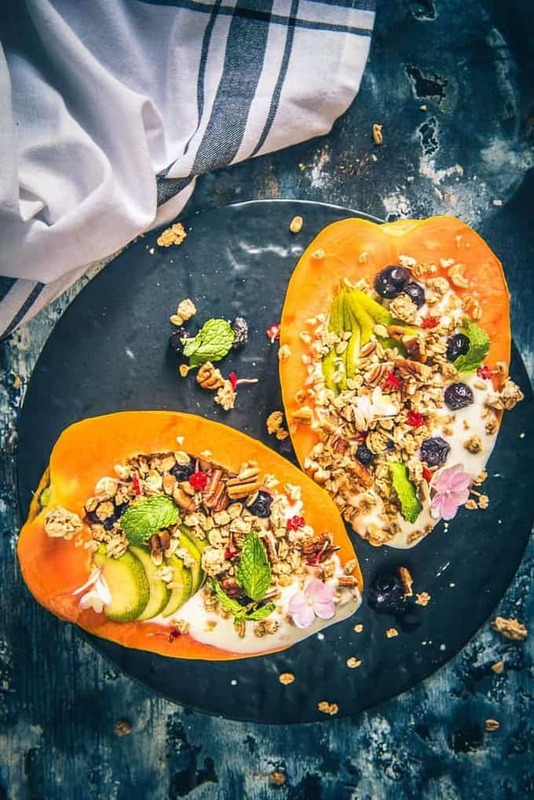 Papaya Boats is a healthy and delicious option for breakfast or snacks which looks irresistible as well. Eat the toppings and then scoop the papaya for a filling breakfast. Cut the papaya into half lengthwise and remove any seeds. Keep the papaya halves on the serving plate. Sprinkle granola and pecan on top. Garnish with fresh mint and edible flowers. Are you making this recipe? I LOVE to see your creations so snap a photo and tag Whiskaffair on Instagram with the hashtag #Whiskaffair and please give a star rating below ★. You can follow me on Facebook, Twitter, Pinterest and Instagram for more such easy recipes. I love this simple way to make an elegant, delicious breakfast. Nice and healthy, too!! I love these gorgeous boats! The tropical flavors make them the perfect summery breakfast!